Edinburgh Hogmanay Party: Happy New Year! If you like parties, you’ll love this. The Edinburgh Hogmanay party is the world’s biggest New Year bash, and one of the safest, with 4 days of festive celebrations and activities. Year after year the Hogmanay street party brings something new to the crowds: with the Torchlight Procession, the Carnival, the Street Theatre, the Seven Hills fireworks, and a host of indoor & outdoor events. The showcase of the Hogmanay celebrations is the concert in Princes Street Gardens, underneath Edinburgh Castle Rock, with the party culminating in the spectacular Street Party with live bands and fireworks. The number of Street Party passes available will usually be 100,000, and all these people will throng the streets to welcome in the New Year. Safety is the priority as you would expect with a major event, and you will need a pass for entrance to the Street Party. They are free but you have to be quick, as it can be difficult to get your hands on one. There is no entry to the Street Party after 11pm, glass containers or bottles are not allowed, and will be confiscated at the entrance. It’s worth mentioning that Edinburgh Hogmanay revellers have always had a good reputation for being a well behaved, friendly crowd, with very few incidents. The stroke of midnight sees complete strangers hugging and kissing, hand shaking and back slapping. You may also hear an old Scottish New Year toast…. The crowd then bursts into singing Auld Lang Syne, the traditional New Year song. Edinburgh has a total of seven hills, and at midnight on Hogmanay, they are all lit up, with the centrepiece being the firework display from the Castle. 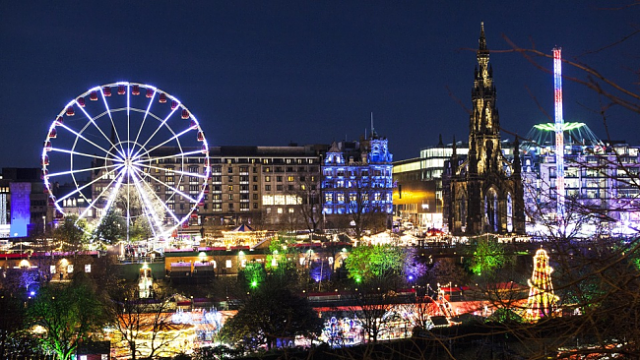 The Edinburgh Wheel and other fairground rides will be open, if you fancy bringing in the New Year with some fun, adventure, and maybe even a little romance. There will be plenty of music, and gigs also take place in Princes Street and the Mound Precinct. Those seeking a more sedate celebration can enjoy a tranquil, candlelight concert in St Giles Cathedral. The festival atmosphere continues on New Year’s Day with Parklife in Holyrood Park, hosting a good range of free family fun events. Hogmanay has traditionally always been more popular than Christmas in Scotland, and this bash has evolved into one of the most popular celebrations in the world. Half the crowd are from overseas, and many of the events are by ticket only. 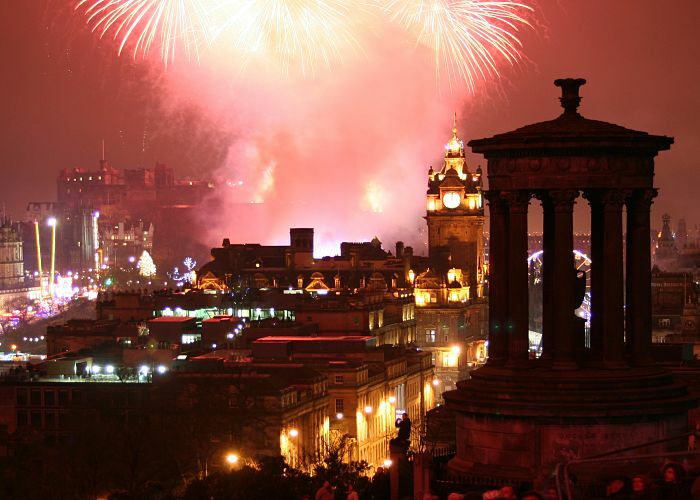 The fabulous Edinburgh Hogmanay is a New Year party quite unlike any other. Book Edinburgh Military Tattoo tickets now for this magnificent spectacle, set against the backdrop of Edinburgh Castle. One of the world’s largest arts events, the Festival stages more than 2,000 shows in hundreds of theatres, and much more.